If you’re in the mood for Italian, head to intimate (only 10 tables!) Marcello Ristorante on U.S. 41. 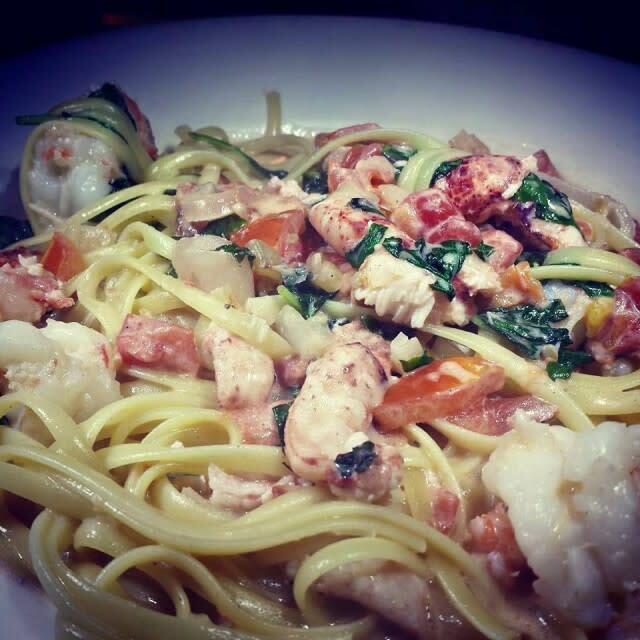 You can’t go wrong with the excellent lobster and shrimp linguine, made with fresh seafood from Walt’s Fish Market, which is right across the street. And if you plan to imbibe, we recommend ordering a bottle of wine from the well-edited wine list, which starts at only $25. In a small cottage next to the Breakfast House on Fruitville Road lives the most delicious, creamy honey by Stubbees. Keffie’s EcoChic Boutique sells both plain and raw creamed cinnamon varieties for $8.95 a jar, and we love it atop crisp sliced apples or baked brie. A little goes a long way, and it’d also be a perfect stocking stuffer or hostess gift. My Sahara go-to is the spanikopita platter ($7.69). The main dish is a sort of “casserole” of finely chopped spinach, feta and a hint of green onion and lemon, sandwiched between layers of crispy, buttery phyllo. But you can make a separate meal out of the delightful sides, too: a super-fresh, super-green Greek salad and Sahara’s famous creamy hummus. Wrap it all together in a piece of warm pita and you’ll feel healthy and indulgent all at once. At a sumptuous tasting dinner for The Table’s new fall menu, we didn’t think we could eat another bite—until we tasted the tender roasted suckling pig with crispy skin, accompanied by mashed Caribbean root vegetables and a confit of fall legumes ($29.95). It’s an irresistible mix of flavors and textures. We loved Painters Palate’s namesake burger ($15)—a big and juicy, it’s wrapped in bacon, stuffed with Boursin cheese and served with honey onions, mushrooms and a big plate of French fries. And heads up—it’s big enough to share!